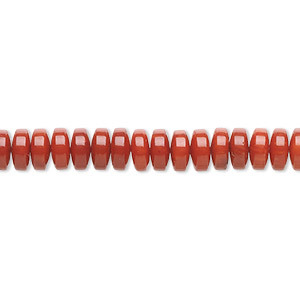 Bead, bamboo coral (dyed), red, 6x2mm rondelle, B grade, Mohs hardness 3-1/2 to 4. Sold per 16-inch strand. Item Number: H20-8443NB Have a question about this item? B grade natural bamboo coral, dyed to a consistent red color with good polish. Minor blemishes and flat spots with consistent drilling and shape. 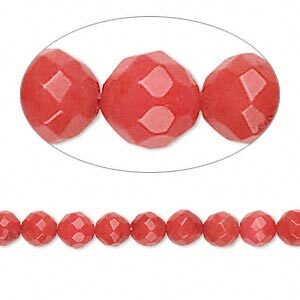 While beads are machine-cut and much more consistent than other coral, beads may vary slightly in shape, size and color. 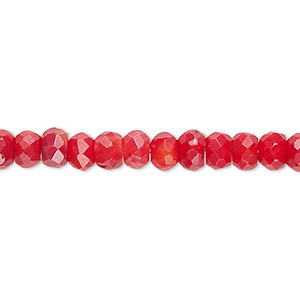 Bead, bamboo coral (dyed), red, 6x4mm hand-cut faceted rondelle, B- grade, Mohs hardness 3-1/2 to 4. Sold per 15-1/2" to 16" strand. 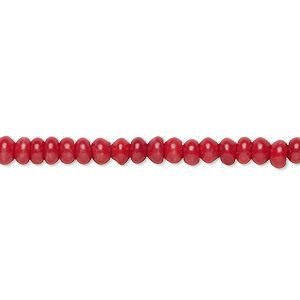 Bead, bamboo coral (dyed), red, 4x3mm hand-cut rondelle with 0.9-1.1mm hole, B- grade, Mohs hardness 3-1/2 to 4. Sold per 15-1/2" to 16" strand. 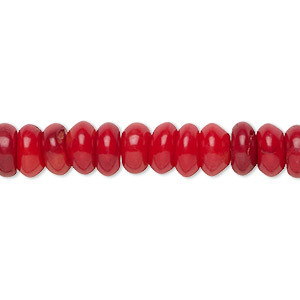 Bead, bamboo coral (dyed), red, 8x3mm-8x4mm hand-cut rondelle, B- grade, Mohs hardness 3-1/2 to 4. Sold per 15-1/2" to 16" strand. 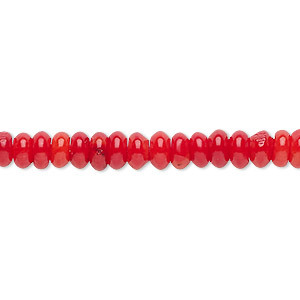 Bead, bamboo coral (dyed), red, 6x3mm hand-cut rondelle, B- grade, Mohs hardness 3-1/2 to 4. Sold per 15-1/2" to 16" strand. Bead, bamboo coral (dyed), red, 6x4mm flower, B grade, Mohs hardness 3-1/2 to 4. Sold per 16-inch strand. 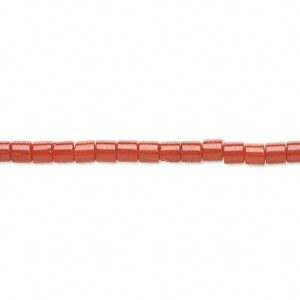 Bead, bamboo coral (dyed), red, 3x3mm round tube, B grade, Mohs hardness 3-1/2 to 4. Sold per 16-inch strand. 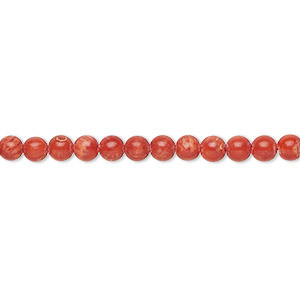 Bead, bamboo coral (dyed), red, 7x2mm round tube, B grade, Mohs hardness 3-1/2 to 4. Sold per 16-inch strand. 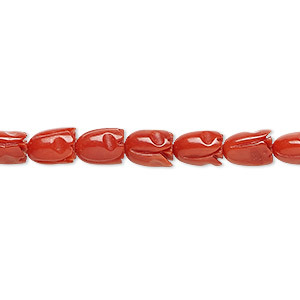 Bead, bamboo coral (dyed), red, 2.5-3mm hand-cut round with 0.3-0.6mm hole, B grade, Mohs hardness 3-1/2 to 4. Sold per 15-1/2" to 16" strand. 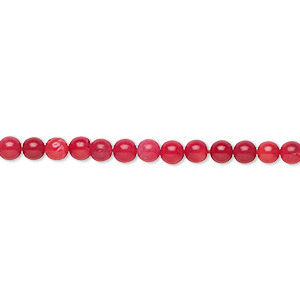 Bead, bamboo coral (dyed), red, 4.5-5mm hand-cut round with 0.6-0.8mm hole, B grade, Mohs hardness 3-1/2 to 4. Sold per 15-1/2" to 16" strand. 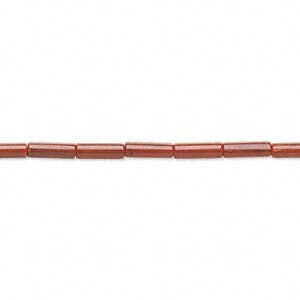 Bead, bamboo coral (dyed), medium to dark red, 5-6mm faceted round, B- grade, Mohs hardness 3-1/2 to 4. Sold per 16-inch strand.